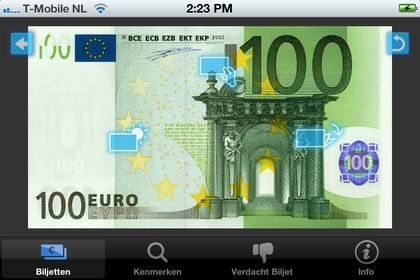 De Nederlandsche Bank, or Dutch National Bank (DNB) has invested in helping people check their Euro banknotes by publishing the so called EuroBiljet app. The app has been developed from one codebase for iOS and Android alike, without any concession to form or function. With the use of PhoneGap, it is possible for the app to make use of the smartphone’s hardware as well. If you’d like to give checking your banknotes a try, you can find the app, developed by Visualspace, in the Appstore and in the Android Market.